Drop Three @ Collectors Corner! D3 @ CC April 9, 2016 A New Kind Of Comedy! Spring is here. The days are getting longer, the nights are getting hotter and nothing is longer or hotter than Drop Three Sketch and Improv. Come on out Saturday, April 9, 2016 to Collectors Corner Parkville at 8 PM, to experience a new kind of comedy for just $10! That’s right, Drop Three wants you to get a load of us Saturday April 9th at 8 PM at Collectors Corner in Parkville. For just $10 you will get all of the improv comedy you’ve always wished for….and more. You can find Drop Three at Collectors Corner MD, one of “Maryland’s Coolest Stores!” Since 2001, Eisner Spirit Nominee 2011, 2012 & Finalist 2013 and Best of Baltimore 2008 & 2012 winner, check them out at www.collectorscornermd.com. So join Drop Three Sketch and Improv Comedy and Collectors Corner MD on April 9, 2016 at 8 PM at Collectors Corner MD in Parkville. Tickets can be purchased online via email at d3improv@gmail.com, by phone at 410-382-3870 or in person at Collectors Corner MD. Drop Three Presents: Couple’s Therapy! Drop Three @ Enoch Pratt Library! It’s April and that means it’s National Humor Month! To celebrate Drop Three Improv and Sketch Comedy is teaming up with the Southeast Anchor Enoch Pratt Free Library to bring you some free educational and comedic stylings! On Saturday, April 4, 2015, at 3 PM, we’ll be performing at the Southeast Anchor Enoch Pratt Free Library as well as teaching free classes for those who want to dip their toes in the comedy and improv pool. You can regularly find Drop Three at Collectors Corner MD, one of “Maryland’s Coolest Stores!” Since 2001, Eisner Spirit Nominee 2011, 2012 & Finalist 2013 and Best of Baltimore 2008 & 2012 winner, check them out at www.collectorscornermd.com. So come on out and join Drop Three Improv and Sketch Comedy at the Southeast Anchor Enoch Pratt Free Library, Saturdays, April 4, 2015 at 3 PM, for some free laughs, which is always a great way to start a weekend! Drop Three is Tripping Balls Y’all! D3@CC, March 14, 2015 at 8 PM! It’s been a long, cold winter and Drop Three is ready to bust out of hibernation, so hop on your narwhal and come out to Collectors Corner MD, Parkville on Saturday March 14th at 8 PM when we kick off spring the only way we know how: with fresh sketch and improv comedy guaranteed to melt the permafrost that’s growing between your toes. Tickets are just $10, and can be purchased online, via email at d3improv@gmail.com, by phone at 410-382-3870 or in person at Collectors Corner MD! All proceeds go towards buying us some cheap bourbon to get us through the next few months until summer! This Friday, Drop Three Presents: Step Out and Laugh! Drop Three Presents: Step Out and Laugh! There are few things better than having fun while raising money for a good cause, which is why Drop Three Sketch and Improv Comedy is raising money for Step Out Baltimore: Walk to STOP Diabetes. Join Drop Three Sketch and Improv Comedy September 26, 2014, to have some laughs and raise money for Step Out Baltimore: Walk to STOP Diabetes, October 5th, 2014, at Canton Waterfront Park. Friday, September 26, 2014 we’re at Main Street Tower, in Bel Air! Tickets are just $20 or $35 for all three shows and available online, by phone at 410-382-3870 or by email at d3improv@gmail.com. For more information about Drop Three’s Sponsored Team go here: http://bit.ly/1nDhjTV. 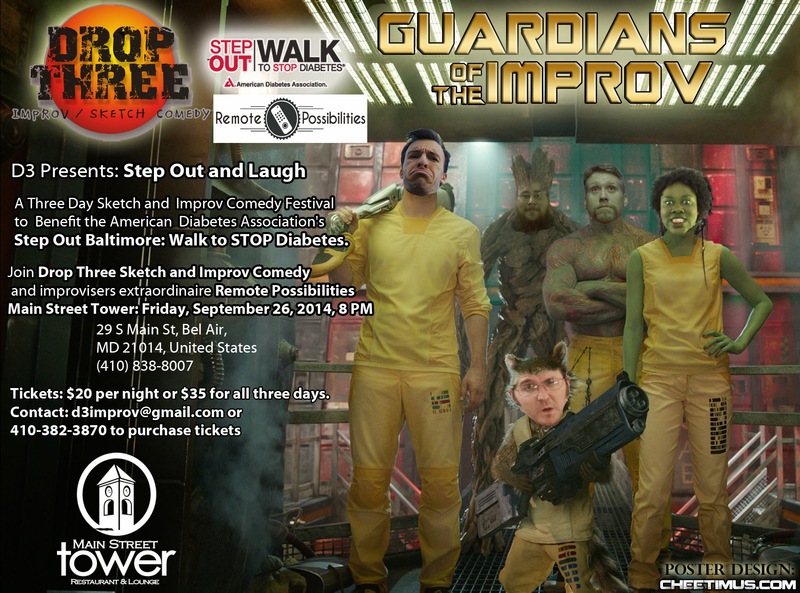 So join Drop Three Sketch and Improv Comedy on September 26, 2014 to get your laugh on and raise money for Step Out Baltimore: Walk to Stop Diabetes. You can purchase ticket here, call us at 410-382-3870 or email us at d3improv@gmail.com. Drop Three Improv and Sketch Comedy is Baltimore’s premiere sketch and improv comedy troupe, combining equal parts Saturday Night Live and Whose Line Is It Anyway into a show that is completely original and interactive every time the cast steps on the stage. Check us out at www.dropthree.com.